Dr. Analena Hope Hassberg is a scholar, activist, and educator committed to organizing low-income communities of color around food justice and environmental justice. She earned her Ph.D in American Studies and Ethnicity from the University of Southern California (USC) before becoming an Assistant Professor of Ethnic and Women’s Studies at California State Polytechnic University, Pomona. 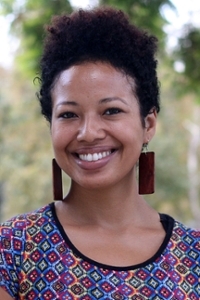 Dr. Hope is a Ford Foundation Predoctoral and Dissertation Fellow, and an active member of several community-based organizations in South Los Angeles. Her research investigates and complicates notions of food security and food sovereignty, and situates food as central to freedom struggles and liberation movements. Listen to Dr. Hassberg's podcast.